Carlos Eire's story of a boyhood uprooted by the Cuban Revolution quickly lures us in, as eleven-year-old Carlos and his older brother Tony touch down in the sun-dappled Miami of 1962-a place of daunting abundance where his old Cuban self must die to make way for a new, American self waiting to be born. In this enchanting new work, narrated in Eire's inimitable and lyrical voice, young Carlos adjusts to life in his new country. He lives for a time in a Dickensian foster home, struggles to learn English, attends American schools, and confronts the age-old immigrant's plight: surrounded by the bounty of this rich land yet unable to partake. Carlos must learn to balance the divide between his past and present lives and find his way in this strange new world of gas stations, vending machines, and sprinkler systems. 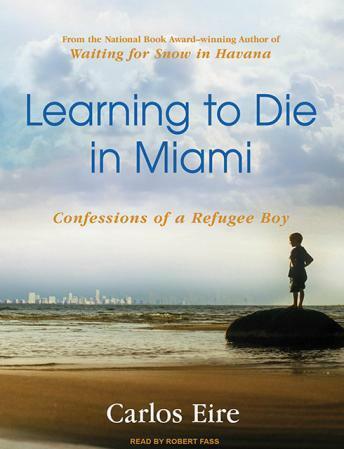 Every bit as poignant, bittersweet, and humorous as his first memoir, Learning to Die in Miami is a moving personal saga, an elegy for a lost childhood and a vanished country, and a celebration of the spirit of renewal that America represents. This book is a sequel to Waiting for Snow in Havana. Both are excellent. I actually liked this one better, but you need to read the first one to understand the second one. Great writing! Narrator is good, but narrator in first book is better.